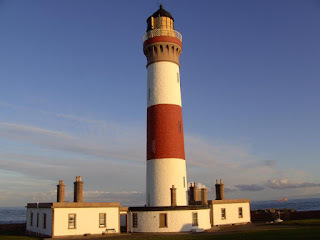 Buchan Ness Lighthouse Keepers Cottages offer self catering holiday accommodation in the village of Boddam near Peterhead, Aberdeenshire. Imagine the views, the smell of sea air, and the freedom of staying in a lighthouse cottage. Now think comfort and luxury and you’re on your way to a Buchan Ness Lighthouse holiday. Located on the north side of the lighthouse, Skerry Cottage has a main bedroom with a king size bed and twin beds in the second bedroom. The cottage has a comfortable living room with open fire, TV and DVD player. It comes with a fully modernised bathroom with period fittings and roll top bath and over bath shower. A well equipped galley style kitchen has access to the outdoor decking area and has magnificent sea views. Dundonnie Cottage has a main bedroom with a king size bed and twin beds in the second bedroom. Relax in the cosy living room with a window seat overlooking the sea. Facilities include a coal fire, TV and DVD player. 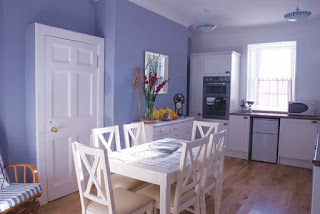 The hub of the cottage is the large kitchen/dining room which seats 6-8 people around the table. Appliances include a dishwasher, split level oven/grill and coffee maker. Central heating in Dundonnie Cottage is supplied by an eco friendly biomass wood pellet boiler. The lighthouse can be found in the village of Boddam. With the breathtaking scenery of one of Scotland’s best kept secrets, the Buchan Coast, the lighthouse is less than an hour’s drive from Aberdeen. With miles of empty beaches, some of the best golf courses and surfing in Britain and within easy reach of castles and distilleries, there is something for everyone.